Who bore to life healers of sicknesses. The first of three pairs of saints known as Kosmas and Damian were unmercenaries and wonderworkers from Asia Minor and commemorated on November 1st. They were brothers both in the flesh and in the spirit, born somewhere in Asia Minor of pious and virtue-loving parents. 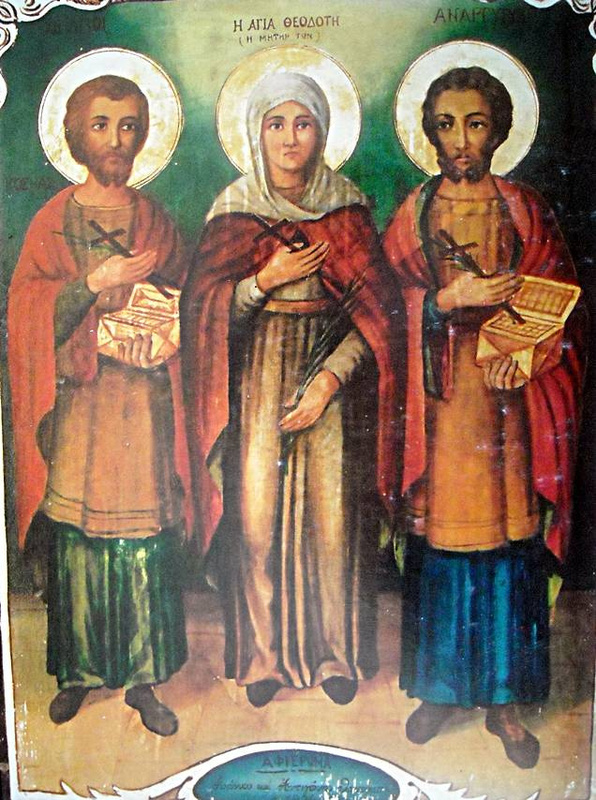 After their father's death, their mother Theodote devoted all her time and effort to educating her sons and raising them as true Christians. God helped her, and her sons matured as sweet fruit and luminaries of the world. They were learned in the art of medicine and ministered to the sick without payment, not so much with medicine as by the name of the Lord Jesus Christ. They were called "unmercenary physicians," that is, unpaid physicians, for they healed freely and thus fulfilled the commandment of Christ: "Freely you have received, freely give" (Matt. 10:8). The brothers died as martyrs, but Saint Theodote reposed in peace after an illness.